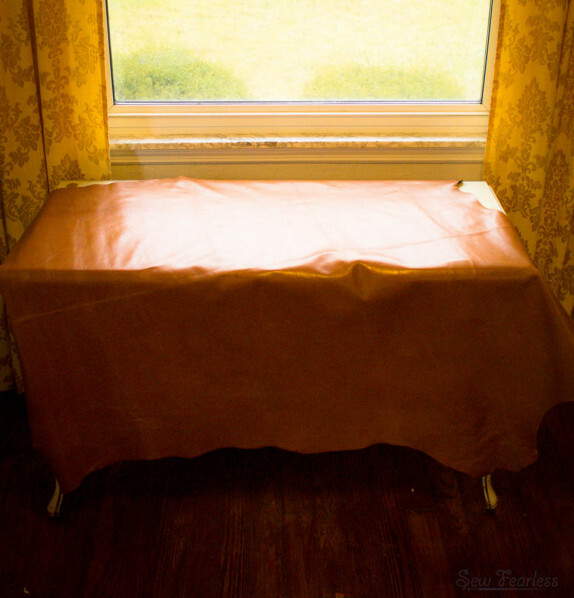 The Leather Hide Store provided the leather for this project and the giveaway prize. All content and opinions are my own. Make sure you read through to the bottom of the post to enter their giveaway! That’s how much I love my beautiful big sister, who put up with my annoying “you are so bossy” complaints in my younger years, and now talks me into knitting projects so we have excuses to message and call each other as adults. Beth has classic style and loves autumn colors, and I tried my best to choose colors that reminded me of her, but my O.M.G LOUD COLORS!!!! preference burst through on the pocket lining. If she hates it, she can just keep that sucker closed. sorry, sis. 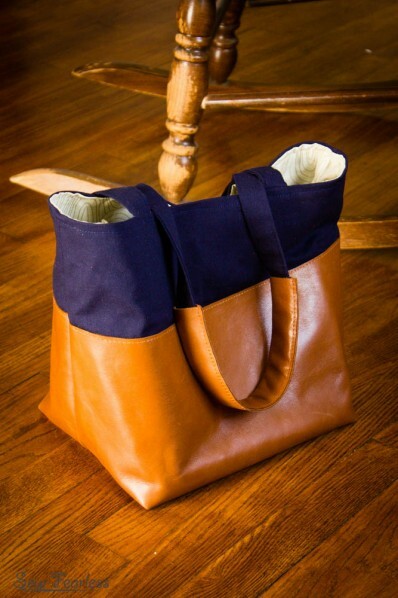 At first glance, this tote looks simple and straightforward. Well, it is simple and straight forward, but it has some fun design tweaks that I am nerding out all over. Second, this isn’t a straight up rectangle tote. The top opening is smaller than the base which prevents it from tipping over, and keeps the top “winging out” like a poorly drafted a-line skirt (if that makes sense). 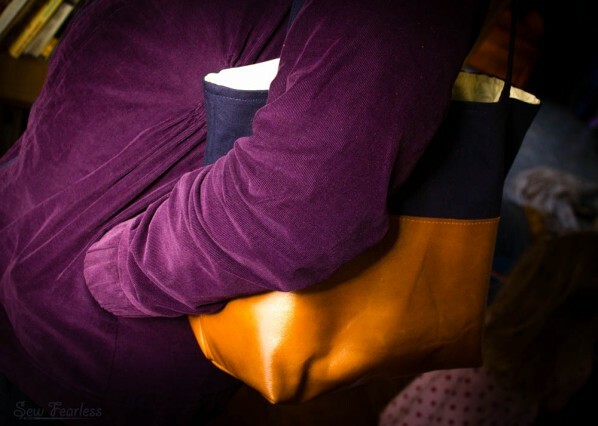 Thirdly, the leather provides just enough structure to the bag,without getting into all sorts of stabilizers and interlinings. Structured, but not too structured. 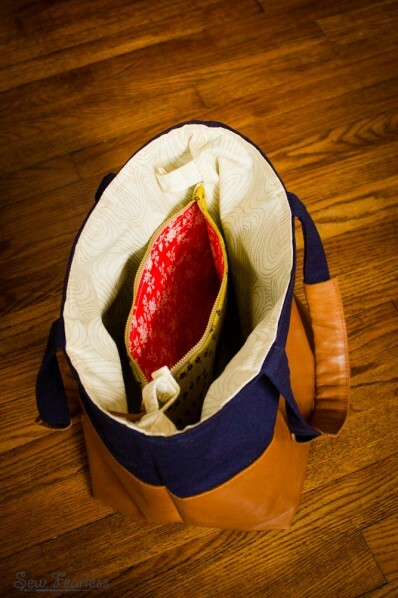 Finally, I figured out how to sew in a divider pocket into a flat-bottomed tote. (happy dance of victory!) 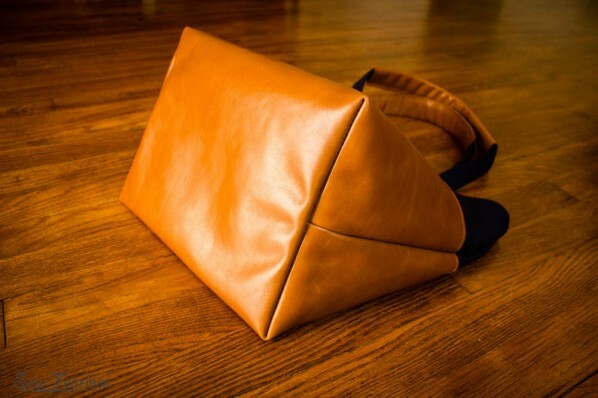 I really should write it up sometime, because I can’t be only Bag Making Geek that is interested in this sort of thing. Leather really has a bad, and undeserved!, reputation for being difficult to work with. If you are intimidated by it, give it a chance to win you over! Use a “leather needle”(I used a size 18 for this 3 oz leather), a roller or a walking foot to help it feed nicely, and no pins. That will do it. I’ve cover these leather sewing tips in more detail here. 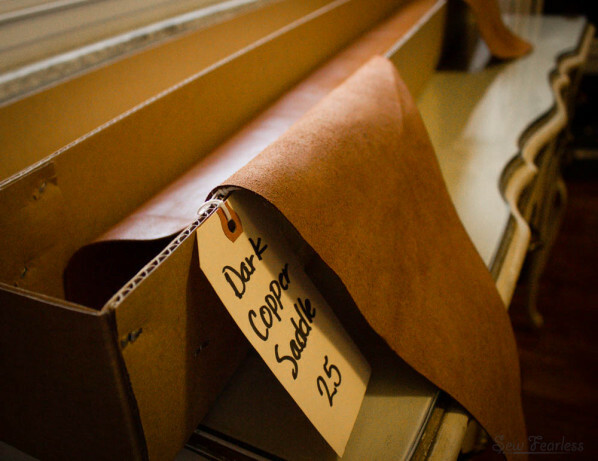 To help you pull the trigger on your leather sewing, The Leather Hide Store is giving away a $50 gift certificate to one of you! Again, thank you to the Leather Hide Store for sending me this leather to work with and for sponsoring this giveaway. Jodi it looks amazing. So glad that you figured out how to do your slip pocket. Love the tote! You know… I still want to make a leather skirt. Maybe time to check out the hide store! Glad to hear that working with the leather wasn’t so bad. Unfortunately, they don’t carry garment leather only mid-weight., which is great for bags and things. I just checked them out and saw that. Boo. Anyway… am I missing the pattern for this tote (have you posted it?) This needs to be made! Love the bag! Lucky sister.. I’m braving my way to leather working with the fake stuff first! 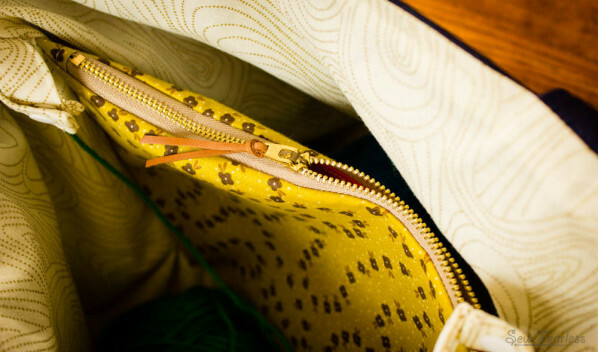 Love the zippered pocket divider.. I’ve put them in a couple times, usually end up a bit loose and i have to fiddle with it..
do you have a tutorial you follow? I tried googling for one with no luck. 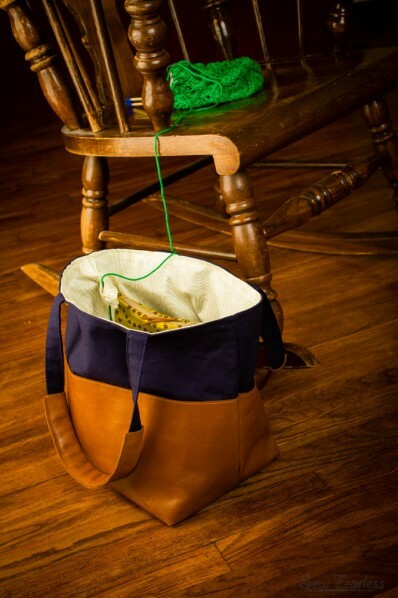 Love the knitting tote! Please please please write up the pocket divider with the flat bottom some day–I’ve definitely wondered about that on past projects. 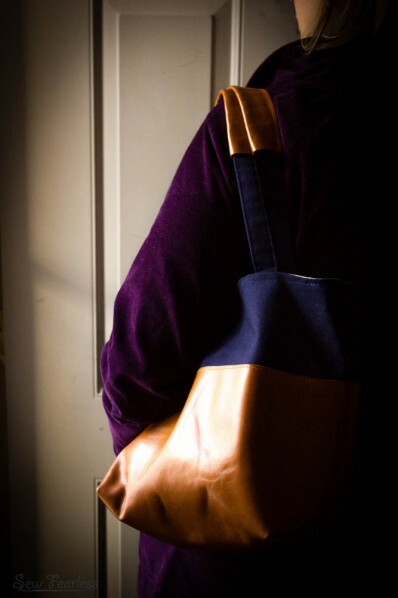 I just took up knitting, and while I don’t quite have enough to “tote” yet, your bag is gorgeous! I love this so much, Jodi. 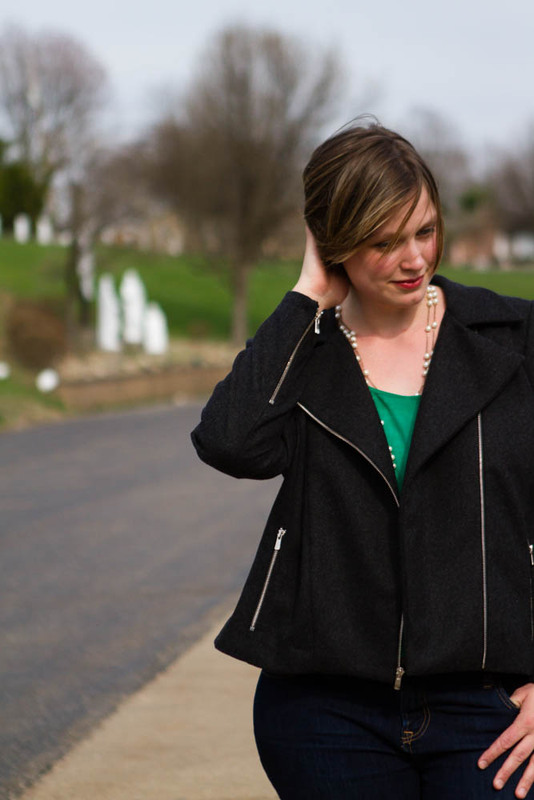 The leather is divine! So pretty!